The new year rally now hangs in the balance as the S&P 500 sits right between its all-time high and December low. On Tuesday, all three major stock indexes notched their second-worst daily decline of the year after China, the world’s second largest economy, posted its lowest annual growth rate in nearly three decades. At Tuesday’s close, the S&P 500 was less than 11 percent from its all-time intraday high of 2940.91 made last September and up nearly 12 percent from its intraday low of 2346.58 from the end of December. As investors weigh where the markets will move, Craig Johnson, senior technical research analyst at Piper Jaffray, notes that the velocity of the move from the lows is extremely rare. “You’re going to push at this downtrend resistance line a couple times before you ultimately see the door open and you see the rally continue,” he said. Johnson, who has a 2,725 year-end target for the S&P 500, encourages investors looking to play for a move higher to target individual stocks for gains. “I want to be buying any of these dips in here. I don’t want to be selling the rallies,” he said. 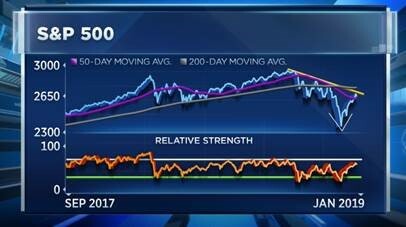 Erin Gibbs, portfolio manager at S&P Global, also believes the bull case for stocks is still intact. She cited a strong start to earnings season, including better-than-expected results from financials last week, as positive indicators for the market. “We’ve seen Q4 growth slightly edge up,” she said. “We’re even starting to see 2019 earnings revise up, and it’s still very early in the season.” However Gibbs cautions that any additional headlines involving macroeconomic or other geopolitical concerns may put pressure on the market rebound. “We think that overall as companies start guiding towards 2019, so far, this should lead us into a further uptrend, and insure investors that we’re still on very solid ground,” Gibbs said.